HR 1154, a bill currently in Congress, champions the right of veterans with service dogs to visit Veterans Administration (VA) properties without restriction. Virginia is home to three VA Medical Centers, including Hampton VA Medical Center, Hunter Holmes McGuire VA Medical Center (Richmond), and Salem VA Medical Center, as well as over a dozen other VA facilities. Currently, only seeing-eye dogs are permitted in these VA facilities, but this legislation would allow service dogs of all types in such facilities. Rep. John Carter (R-Texas) sponsored the new bill and said that the bill will draw little debate. Vision impairments are no longer the only need for a service dog. Veterans with mobility, hearing and psychiatric impairments now use service dogs. However, under general VA policy, these veterans and their dogs are not granted access to VA facilities. It is up to officials to decide if they want to let them enter. Imagine a military veteran suffering from post-traumatic stress disorder (PTSD) not being allowed in a VA hospital, due to the fact they require a service dog to be independent. A policy change is taking shape at the VA that would allow veterans with mobility issues to get a service dog, and the policy can take effect as early as June. This change is in addition to Carter’s bill, which 35 Congress members have cosponsored. The bill takes into account an increasing number of veterans coming home with missing limbs and PTSD. Service dogs can be trained to aid veterans with PTSD and other mental health issues by recognizing the beginning stages of panic attacks and being there for support. Carter is not the only strong supporter of the bill. Christina Roof, AmVets legislative director, said the bill intends to modernize an outdated VA policy that did not consider how necessary and widespread service dogs would be. 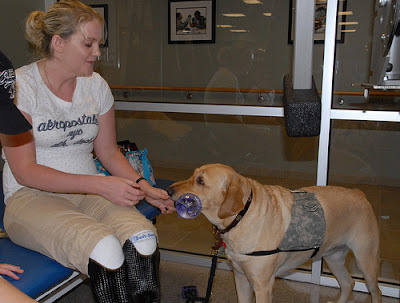 She compared the need of a prosthetic and the need of a service dog as being one in the same. Roof also said that the VA’s policy change comes with loopholes that need to be filled; otherwise, veterans may not get the services they need and deserve. Carter called this bill commonsense, and said that if seeing-eye dogs enter VA properties without restrictions, other service dogs should be able to do the same. Matt Polsky is a blogger associated with VA Benefit Blog and VA Mortgage Center.com. VA Benefit Blog provides service members with up to date information on the VA benefits they have access to, while VAMC is the nation’s leading provider of VA home loans. Be sure to check our Carrie's latest guest post at FIDO Friendly: Dog Park Readiness for Fido's First Visit. Oh good grief! This is such important news! I found you through Jazzi's blog. ALL SERVICE DOGS need access to facilities to PROVIDE SERVICE TO SERVICE MEN AND WOMEN. It's not only common sense, it's the right thing to do. Wow... I had no idea only seeing-eye dogs were allowed. All service dogs should be! This would be all well and good but the bill was passed through and it only allows SOME service dogs through. That's right only SOME! So some veterans who have service dogs still cannot access VA facilities and some that had access when there wasn't a bill will now be refused. In addition getting a service dog that would fall under their rules is very difficult, takes an unholy amount of time if you can even manage it and can even be EXPENSIVE...like 20-40k worth of expensive. So tell me again how great this is? We just slapped our disabled veterans straight upside the face.